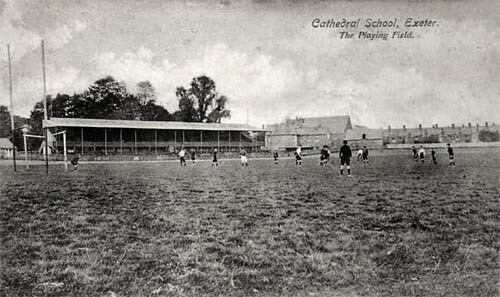 Initially formed as early as 1871, the first recorded match of Exeter Rugby Club was against the training college (latterly St Luke’s) on October 26, 1873 – playing in a field belonging to Mr Morrison and then in the Militia Field behind the barracks. Subsequently, the club went to the Cricket Field at St Thomas (the former County Ground) then Matford only to return to the County Ground, where they would stay until the culmination of the 2005/06 season. Throughout its many years of existence, Exeter Rugby Club has not only helped forge the careers of many fine individuals players, some of whom have gone on to achieve international honours, but its long-lasting traditions of sportsmanship, honour and team work have continued to move throughout the many years. To list the efforts of players throughout the decades would surely be an endless task, but the way the Devon club has moved with the times – now featuring amongst English and European Rugby’s elite teams – is something to be truly cherished. The progression made, particularly over the past 20 years is certainly notable, and having moved away from their former base at the County Ground, Exeter Rugby Club are now regularly playing host to crowds of almost 11,000 spectators. Much of the transformation of Exeter Rugby Club has happened since the English rugby scene turned professional in the late 1990s. At this time a limited company structure was created to run all of the club’s affairs through a board of seven directors, chaired by local businessman Tony Rowe. It was an inspired move as the direction of the new board not only saw Exeter Rugby Club rise on the field, but off it as well there was also much to promote as individuals, businesses and key sponsors came together to help provide financial backing to the playing squad. Even now, however, it remains a members’ club with the company shares held by four trustees – John Lockyer, Bob Staddon, Paul Derbyshire and Ian Pugsley – who act on the sole wishes of the 700-strong membership. The need, though, to grow the club and the business has advanced at some pace and having rebranded the club in 1999 to that of the Exeter Chiefs, Devon’s finest have made significant progress. Former Director of Rugby, Ian Bremner, oversaw the early years of the semi-professional era at the County Ground when the Chiefs would regularly challenge for the top division, only to be pipped by sides such as Leeds Tykes, Rotherham and Worcester. The Irishman’s input was hugely beneficial and although his time in charge eventually came to an end in 2006, the Chiefs were already moving in the right direction with a new stadium on the outskirts of the city approved and a former player, Pete Drewett, set to take charge of a new-look and full-time squad. Former England Under-20s team manager Pete Drewett took charge in 2006, the same year as the club moved into their new, state-of-the-art stadium at Sandy Park. Ironically, they opened up at their new home with a 13-13 draw against Coventry, the opponents they faced in their final outing at the old County Ground. Drewett’s first year ended with the Chiefs finishing fourth in the standings, but improvements followed as the Chiefs recorded back-to-back second place finishes. The trouble was, however, that in both those years they came behind former top flight clubs Northampton Saints and Leeds in the race to join the Premiership. The need to get into the promised land of the Premiership prove too much for Drewett, who was relieved of his duties – along with fellow coach Paul Larkin – in March 2009 following Exeter’s 32-24 defeat at Moseley. Former England international Robin Cowling assumed control of on-field matters, along with former players Bob Staddon and Rob Baxter for the remainder of the season, before Baxter was then installed as Head Coach for the 2009/10 season. Immediately, Baxter recruited the services of former Northampton and England fly-half Ali Hepher as his assistant, whilst another former Exeter player, Ricky Pellow, was drafted in as skills coach. Together the group gelled instantly in the new-look RFU Championship, which had taken over from the old National League One. Although the Chiefs had finished the normal season as runners-up to near neighbours Bristol, the two would subsequently progress through the latter stages to the first-ever Play-Off final, the victors of whom would advance into the Premiership. After a tight first leg and in front of a record crowd at Sandy Park, the Chiefs held a narrow 9-6 lead thanks to three penalties from Irishman Gareth Steenson. With pundits giving the Chiefs little hope ahead of the second leg, the tactical nous of Baxter and his trusty lieutenants came to the fore when, on a cold and wet night at the Memorial Stadium, they crushed their more established rivals 29-10 thanks to a last-minute try from Simon Alcott and the boot of Steenson. As the champagne flowed, the dream of Premiership Rugby had been realised and the hard work was just about to begin for Baxter, his staff and his players – many of whom had never experienced life in the top division before. Given little hope of survival by anyone outside the confines of Sandy Park, the Chiefs marked their introduction to life another run up the ladder by producing a stunning opening day win over Gloucester. It was the first of 10 league wins the Chiefs would produce during the season as Baxter’s newcomers – who would eventually finish in eighth place – also claimed the prized scalps of established sides such as Newcastle Falcons, Saracens, Leeds, Harlequins, London Wasps, Sale Sharks and Northampton Saints. Exeter’s first foray into Europe also brought rewards with victories over Bourgoin and Newcastle, although Montpellier would triumph in both encounters. Having exceeded expectations in their debut year, again there was much talk ahead of the new season as to whether the Chiefs could match their achievements. Again some wise recruitment during the off season from Baxter paid dividends as the new stock – coupled with the ever-improving efforts of much of his Championship-winning squad – saw the club advance yet further. Come the end of another exciting year, the Chiefs had not only collected 12 Premiership wins – including memorable wins on the road against Gloucester and Worcester Warriors – but their fifth place finish had also secured themselves a place amongst Europe’s top clubs in the Heineken Cup. The Chiefs were now entering into new and unchartered waters as they prepared for the 2012/13 season, where not only the might of the Premiership awaited them, but also Europe where they were paired against heavyweights sides Leinster, Clermont Auvergne and Scarlets. Although it would prove a tough baptism amongst Europe’s elite clubs, the Chiefs proved on more than one occasion that they were capable of mixing it with the very best, including picking up home and away victories over the Scarlets, as well as running defending champions Leinster to within a score in both fixtures. Domestically, the Chiefs continued to prosper within the Premiership where they were again able to secure another top six finish, which included an impressive last-day victory over Gloucester at Sandy Park. 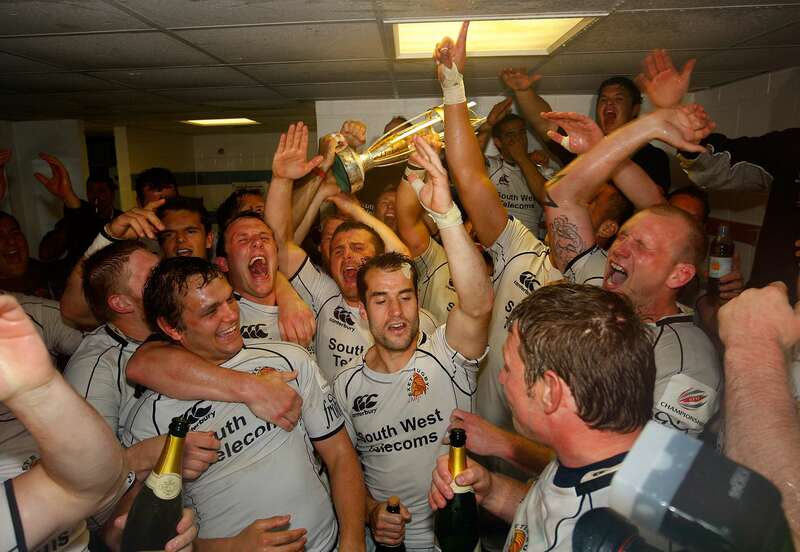 The 2013/14 season will forever be etched into the memories of Exeter supporters as this was the campaign in which the Chiefs finally secured their first piece of major silverware. Victory on home soil against a strong Northampton Saints side saw Rob Baxter’s men lift the LV= Cup for the first time thanks to a 15-9 victory. Skipper Dean Mumm and Chris Whitehead claimed the all important tries, whilst rising fly-half Henry Slade slotted the other five points with a penalty and a conversion. Sadly, that would prove to be Whitehead’s final game in club colours as he was one of three players – Tom Hayes and James Hanks the others – who would be forced to retire prematurely through the course of the season due to injury. All three had indeed played their part in the club’s recent rise to success and the loss of the trio was felt on and off the field as the Chiefs ended the Premiership campaign in eighth place. It meant they missed out on qualification for the new-look top tier of European Rugby, but head coach Baxter admitted the strain of trying to compete on three fronts had ultimately taken it’s toll on his ever-improving squad. Highlights of the year included a full England debut for Jack Nowell, who together with Tom Johnson helped their country to finish runners-up in the Six Nations. Sam Hill, Dave Ewers, Dave Lewis and Slade would all go on to claim representative honours with England during the course of the season, whilst young flanker Joel Conlon was able to claim his second Junior World Championship medal as he helped England Under-20s defend their title with victory over South Africa in Auckland. 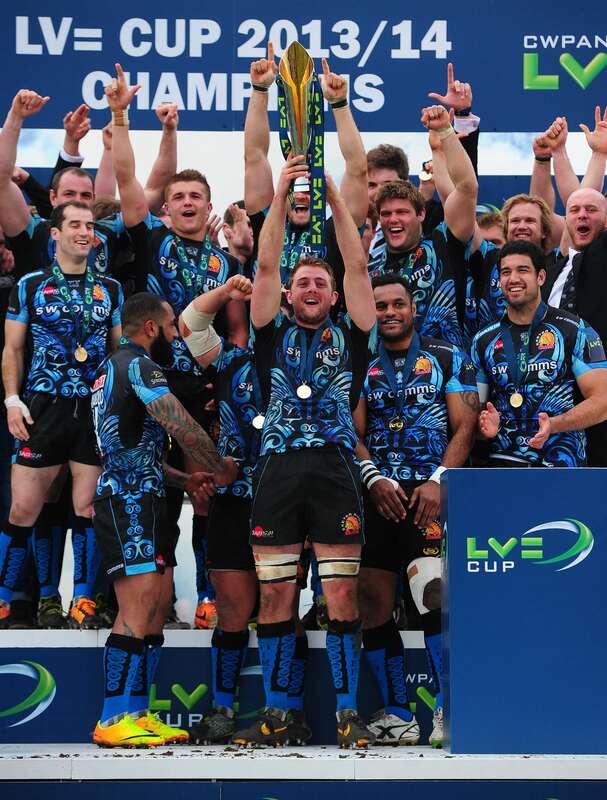 Having secured their first piece of domestic silverware, the 2014/15 season was to see even more progress at Sandy Park, both on and off the field. During the close season the stadium itself underwent a huge £12 million redevelopment, doubling capacity in the West Grandstand and East Terrace, as well as the introduction of a new Desso-made playing surface that allowed the team to not only play, but also training fully on the pitch. Ahead of the new season, Baxter had bolstered his ranks with a number of new faces, including England international Thomas Waldrom from league rivals Leicester Tigers. The all-action No.8 was to enjoy a stellar first season in the Westcountry, finishing the season with 17 tries (16 of them in the Premiership) and helping the club to finish a best-ever fifth in the final standings, narrowly missing out on the end of season play-offs on points difference. As well as an outstanding league season, the Chiefs came within a whisker of reclaiming their LV= Cup title, going down to the final kick of the game against Saracens at Northampton, whilst the club also advanced to a first-ever European semi-final only to be undone by eventual Challenge Cup winners Gloucester at Kingsholm. 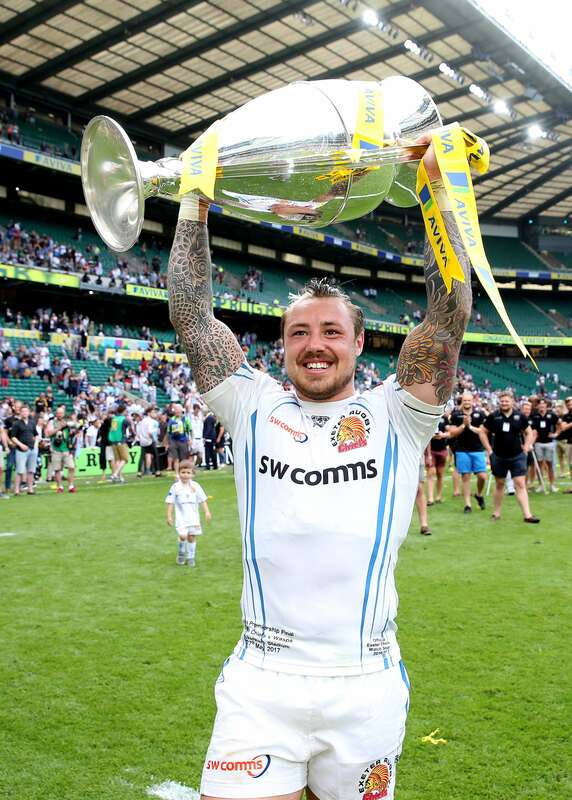 On the field, Jack Nowell continued to thrive at international level, whilst England head coach Stuart Lancaster also awarded Saxons call-ups for Henry Slade, Waldrom, Luke Cowan-Dickie and Dave Ewers. Slade and Ewers, together with Tomas Francis and departing skipper Dean Mumm, were all selected for the BT Sport Dream Team of the Year at the annual awards night, whilst Waldrom collected the league’s top try-scorer award and Slade followed up his prize of winning the RPA Young Player of the Year title with a similar accolade at the Premiership night. Having narrowly missed out on the Premiership play-offs, the Chiefs reported back for the 2015/16 determined to build on the previous campaign and establish themselves firmly as one of English rugby’s top four clubs. Buoyed by the arrivals of key names such as England and British Lions lock Geoff Parling, Italian international Michele Campagnaro, Aussie flanker Julian Salvi and Bath flyer Ollie Woodburn, the season didn’t get off to the best of starts when they were undone narrowly on the opening day by rivals Bath. However, Baxter’s side would quickly recover, producing a season that delivered on all fronts. Not only did the Chiefs advance to the last eight of the European Champions Cup for the first time following a dramatic last day of action in January, but they would also go on to secure their place in the end of season play-offs for the first time. Undone by rivals Wasps in European battle, the Devonians gained their revenge in the final few weeks of the season, defeating the big-spending Midlanders twice – the second time the play-off semi-finals – to advance to Twickenham for the main Premiership final. Standing in their way were Saracens, who just took weeks earlier had already been crowned ‘Kings of Lyon’ having lifted the Champions Cup over Racing Metro 92. Spurred on by thousands in the travelling tribe, the first half at Rugby HQ didn’t quite go to plan for the Chiefs, who trailed 23-6 to the much-fancied Londoners. The second half, however, was another thing all together and back they roared courtesy of converted tries from Jack Yeandle and Jack Nowell. With just three points separating the two sides heading into the last few minutes of the match, it was Saracens who delivered the knockout blow when man of the match Alex Goode claimed a late try to secure victory. Although gutted with the outcome, the Chiefs had underlined their growing emergence within the game with an outstanding display. Head coach Rob Baxter admitted afterwards that his side would learn from the whole experience, insisting they would be back all the more stronger in 2016/17. Off the field, the Chiefs continued to pick up honours aplenty with Thomas Waldrom (top try-scorer) and Gareth Steenson (top points-scorer) picking up awards at the Premiership’s annual dinner. Steenson and Don Armand were also shortlisted for the division’s Player of the Year accolade, while Rob Baxter himself was among those nominated for the Director of Rugby prize. Steenson and Nowell were both named in the BT Sport Dream Team of the season following outstanding campaigns and Nowell was among three Exeter players – Slade and Cowan-Dickie the others – who were part of England’s highly successful summer tour to Australia, where England emerged 3-0 victors following tests in Brisbane, Melbourne and Sydney. Looking to build on the previous year, things did not start brightly for the Chiefs at the start of the 2016/17 campaign as they lost seven of their opening 10 games in all competitions to leave them not only languishing at the wrong end of the table, but also facing a huge uphill struggle in terms of their European aspirations. A heavy home loss to Clermont-Auvergne, plus a last-gasp defeat at Sandy Park to rivals Bath at the end of October were to prove a turning point in the season. Having not really put a full stop on the previous year, Baxter and his team rallied in the wake of these setbacks to produce a stunning run of results that would ultimately lead them back to Twickenham. After the Bath loss, the Chiefs would not lose again in the top flight, finishing the scheduled season in second place and riding high on confidence as they prepared to welcome champions Saracens into town. In a pulsating encounter, played out in front of a capacity crowd, the game ebbed and flowed before the Chiefs delivered a telling blow in the final minute. Having just surrendered the lead just minutes earlier, Slade delivered one of the great touch-finder kicks the Premiership has ever seen to put his side in sight of the line. Literally in the last-chance saloon, the Exeter eight formed together to propel young Sam Simmonds over the line for a match-winning score. Returning to Twickenham for a second successive season, this was a much different Chiefs that arrived in the capital. Whereas 12 months earlier they may have been happy to mix it on English rugby’s greatest stage, this time nothing less than victory would suffice for Devon’s finest. With lessons learnt from the previous year, the Chiefs started well storming in front thanks to tries from Nowell and Phil Dollman. Wasps, however, rallied and stung Baxter’s side with a blitz of scores from Jimmy Gopperth and Elliot Daly. As the minutes ticked by, it was Wasps who held a slender lead. That was until the Chiefs were given a lifeline in the dying minutes when Nathan Hughes infringed. Not for the first time in his career, Steenson stepped forward to drill a sublime penalty between the posts. Level at full-time, it was the Chiefs who looked the stronger in the searing heat of extra time. Spurred on by thousands from the travelling tribe, the decisive moment came late in the second half of added on time. With Simmonds denied a try by the TV match official, the Chiefs used the resultant five metre scrum to win another penalty. Offered the golden ticket, Steenson grabbed it with both hands, landing the decisive penalty that ensured a first-ever Premiership title was heading its way to Devon. Unbelievable scenes both that day – and in the days that followed – helped to mark the occasion and put the Chiefs firmly top of the tree in terms of English rugby. Days later, Nowell would go on to become the club’s first-ever British & Irish Lion when he featured twice off the bench in their series draw with world champions New Zealand, whilst on the international scene a busy summer saw England hand first caps to the Exeter trio of Don Armand, Jack Maunder and Harry Williams. Baxter’s efforts in leading the club to title success were also rewarded when he was handed a Honorary Degree by the University of Exeter, whilst the city itself marked his achievements by offering him the Freedom of the City. Having been crowned champions for the first time in the club's history, Baxter's side came back the following year hellbent on trying to make it back-to-back Premiership successes. Now, however, they had a much bigger target on their backs and that was illustrated on the opening night of the season as Gloucester grabbed a last-gasp victory at Kingsholm when New Zealander Jason Woodward darted over in the final minute of the match. That would be just one of five defeats the Chiefs would suffer from their 22 regular season fixtures. With just one defeat on home soil - that was against Worcester Warriors in a low-scoring affair at Sandy Park - the Devonians again had home advantage in the end of season semi-finals, having secured top spot in the table by eight points from Saracens. It set up a testing last four showdown with surprise package Newcastle Falcons, but Exeter's big-game experience and home advantage would prove telling as they saw off Dean Richards' side to seal a third successive trip to the capital to decide the Premiership champions. Although the Chiefs came into the game full of confidence and on great form, they struggled to handle the power, pace and precision of two-time European champions Saracens, who denied them of glory with a 27-10 victory in front of over 75,000 fans at Twickenham. The season, though, was still deemed a huge success for Baxter and his side as not only did they again create records in the Premiership, but the club also secured a second Anglo-Welsh Cup success when they beat Bath 28-11 at Kingsholm. Tries from Jack Innard and Toby Salmon, coupled with 11 points from the boot of fly-half Joe Simmonds proved decisive on the day. In Europe, Exeter started their campaign in style with victories at home to Glasgow Warriors and away to Montpellier, but defeats to Leinster in the December double-header left them with plenty of work to do heading into the New Year. Thankfully, the Chiefs rose to the task defeating Montpellier on home soil, but needing a win to secure a place in the last eight, Baxter's side were undone by the Warriors in a bitterly cold Glasgow, ending their hopes of advancing for another year. The on-field success of the Chiefs was noticed by the England selectors with Henry Slade, Alec Hepburn, Sam Simmonds, Jonny Hill and Harry Williams all travelling to South Africa for their summer tour, while elsewhere Italian centre Michele Campagnaro and Welsh prop Tomas Francis added to their tally of international caps.